Home Ever noticed mist on your windows? Ever noticed mist on your windows? Gary Warby, Managing Director Premier Windows, talks us through why condensation occurs on the outside of double and triple-glazed windows in the autumn and spring. John Keats once said autumn was ‘a season of mists and mellow fruitfulness’. And this is a clue as to why your energy efficient windows and the glazed units on doors can become misted on the outside in the early autumn going into winter and again come the spring. People ask us about this a lot. People buy new windows to help them to address problems with internal condensation. In this case energy efficient double and triple-glazed windows help to reduce internal condensation by putting a barrier between warm air inside and the cold outside. The reason condensation forms is moisture in the air and dew point. The dew point is where moisture and water vapour in the air forms into droplets or ‘dew’ when in contact with colder surfaces. If you still have single-glazed windows, this is why you get condensation on colder days. Your home is full of moisture from things like cooking and showering. If it’s cold outside, single-glazed windows will be cold on the inside. The water vapour in warm air is attracted to the colder glass, forming internal condensation. This is not as much of a problem in double glazed and triple glazed windows as the temperature of the internal pane is warmer in comparison – the cool air externally is blocked by the outside pane. But conversely in contributing to a reduction in internal condensation energy efficient double and triple-glazed windows reduce the amount of heat escaping from your home, which means in certain conditions, it’s more likely to form on the outside. 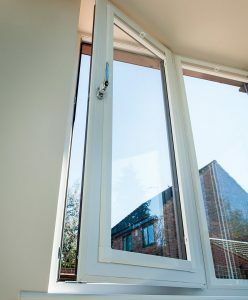 During cooler late summer and autumn evenings, the energy efficiency of thermally efficient double glazed units over single glazed windows, means that there is so little energy and warmth escaping your home, that the temperature of the external pane, falls to a level below that of the air temperature or the dew point. This informs us that the vapour that occurs naturally in the air condenses on external glass, which can leave windows misted on the outside in the mornings. The rule is that the warmer the air the more vapour it can ‘hold’ so as the air temperature warms up with the morning sun, this outside condensation or dew, evaporates back into vapour. It’s reason why in late August and September, you’ll start to notice the heavy dew on grass. However on a handful of mornings when specific climatic circumstances are right, it means that you can wake up to external condensation. But this is simply the product of the high level of performance double and triple-glazed energy efficient windows are delivering within your home. This is certainly nothing to be concerned about. The dew point is variable and as the air temperature cools outside as we head into winter, the small amount of heat that will continue to escape from your windows, compared to the far colder air temperature in winter, means that they’ll remain clear of condensation. For more information call 0800 854 353 or email enquiries@premwindowsanddoors.co.uk.